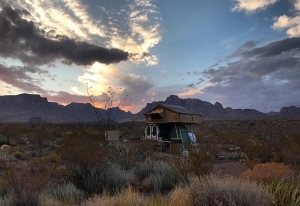 Big Bend National Park, located in Southwest Texas, is a truly unforgettable place. With over 801,000 acres, there’s so much room to roam and explore. And while the park is quite rugged and desolate in most places, we found it to be a beautiful haven away from the rat race of life. 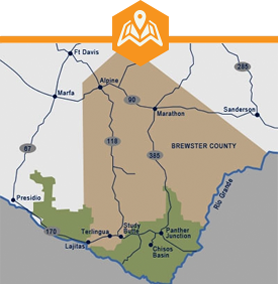 We’ve wanted to visit Big Bend for quite some time. We’d just never made it down that far. One reason I was so excited to visit was because I can remember my grandmother telling me about Big Bend when I was a little girl. Having grown up in Texas, Grandma always kept the Texas vacation guide on her coffee table; and I would browse through all the pictures, dreaming of the day when I could visit some of the places in that guide. 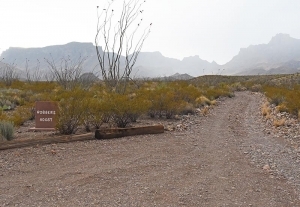 One of those places was, of course, Big Bend National Park. Robbers Roost on Juniper Canyon Road. 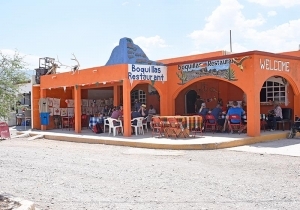 While we normally don’t plan a lot of the details on any of our travels, we did plan a trip to Boquillas. So we made sure to pack our passports for our trip across the border. Jose Falcon’s Restaurant in Boquillas, México! Big Bend was even more amazing than I ever imagined it could be. Backcountry camping in the middle of the Texas desert, with the Chisos Mountains on one side and Mexico within sight, was an experience we’ll never forget. Stars that lit up the darkness with their brilliance kept our necks craning up into the vast expanse of the night sky. Sunrise and sunset that splashed color all across the desert left us in awe. Waking up to the sounds of wildlife in the early morning hours left me craving more of that quiet stillness that only comes with being in the middle of nowhere. Sunset over the Chisos Mountains, Big Bend National Park. 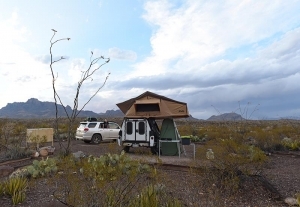 Click here to read more about our experience Backcountry Camping in Big Bend National Park, as well as get safety tips for camping in the backcountry.